Evolven brings together APM tools to answer “what’s wrong with my application?” “what’s changed?” and “why?”. In this report, EMA's Vice President, Dennis Drogseth, explains the challenges facing organizations adopting cloud and DevOps. Dennis states that "Monitoring and tracking changes as they occur is critical" for delivering applications at an ever higher pace. Dennis further explains that "Evolven brings together APM tools to answer “what’s wrong with my application?” “what’s changed?” and “why?”. 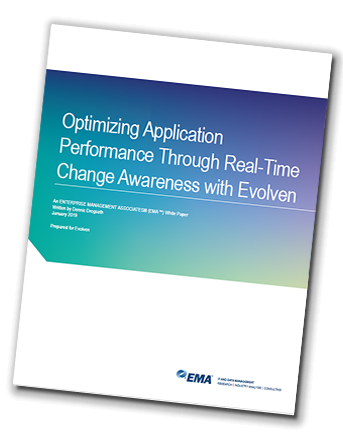 Dennis concludes: "It is EMA’s opinion that for large or complex enterprises where changes occur frequently and where application performance is critical, Evolven deserves top-of-the-list attention." DOWNLOAD this insightful report and learn how Evolven Change Analytics can slash MTTR and cut the number of incidents in your enterprise cloud environment. "The move to cloud carries challenges with it that can significantly impact application performance: struggles to understand true root cause in this complex world of shifting interdependencies, and most prominently, the inability to relate change to performance overall". Bridging the divide between APM and real-time change awareness is an area of tremendous potential for value and growth in the industry. ". Fill in form to DOWNLOAD the report PDF file.